Free community event with a sound stage & beer garden in Town Center, Kids Fest at Banbury Fair, Bartlett Bazaar at Oak & Bartlett Rds, Jeweler’s Row on Oak and Fun Fair at Derango Dental. Saturday Pet Event in Bartlett Park, Sunday Classic Car Show on Oak St. And much more. Visit www.bartlettheritagedays.com for full details. Those of you in the northwest suburbs of Chicago can meet me during the two day Bartlett Heritage Days in Downtown Bartlett, IL. Stop by our booth at the Business Expo for brochures, special offers, give-aways, and more. Whether you are planning a short or long vacation on land or sea, we have plenty of ideas to share with you to get your dream trip started. If you love Food & Travel you should join #FoodTravelChat every Wednesday at 8 PM Eastern. I'm one of the chat moderators. Each week we discuss a new food and travel related topic. Dangerous Hurricane Lane approaches the main Hawaiian Islands. 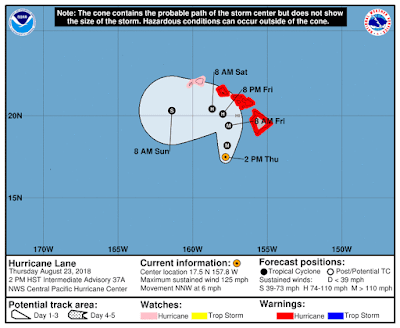 The Central Pacific Hurricane Center (CPHC) in Honolulu Hawaii predicts a slow northward motion to begin this afternoon and continue through Friday. A turn toward the west is expected Saturday and Sunday, with an increase in forward speed. The latest forecast track from the Central Pacific Hurricane Center brings the center of Lane dangerously close to the main Hawaiian Islands Thursday afternoon through Saturday. Regardless of the exact track, life threatening impacts are likely over many areas as this strong hurricane makes its closest approach. Do not focus on the exact forecast track or intensity of Lane. Be prepared for changes in future forecasts. Although the official forecast does not explicitly indicate Lane's center making landfall over any of the islands, this could still occur. Full coverage of this, and all tropical storms, can be found on our Hurricane Zone page. 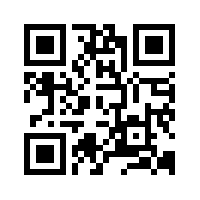 There are RSS feeds from the National Hurricane Center posted there giving you up to the minute information. For storms that impact cruises, we will bring you information on those details as well. Please bookmark that page for further reference during the Hurricane Season which runs now through November 30th. Due to Hurricane Lane in the Pacific, Norwegian Cruise Line has modified the itinerary for Pride of America. The ship is currently out at sea, away from the storm. Pride of America is expected to return to Honolulu on Sunday, August 26th. The previously scheduled August 25th sailing will be delayed until Monday, August 27th. Embarkation will be available on both Sunday, August 26th and Monday, August 27th. The next #WeekendWanderlust twitter chat will take place Tonight Thursday August 9th at 9 PM Eastern time. This week’s questions are all about Europe travel. Preparing for this week's chat, we gave that question some serious thought. Most likely the first thing that comes to mind is backpacking across Europe, traveling by rail, and staying in hostels. That's fine if you are in your early twenty's but after that, we doubt that would be your preferred method of travel. We can't argue that backpacking across Europe is the epitome of budget travel, but for those that can no longer travel in that fashion, the next best thing could be seeing Europe by cruise ship. If you are coming from the United States, the cost of air travel will be your largest component. Since it is a fixed cost, no matter what you do upon arrival in Europe, we will not factor that into our budget assessment. 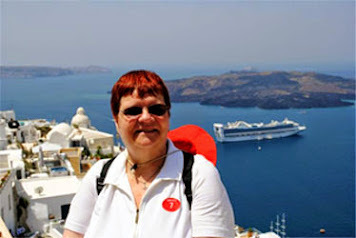 We'll use a Baltic cruise for an example on how cruising in Europe can be budget travel. 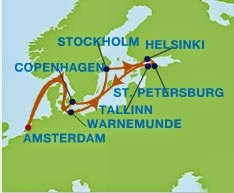 A typical Baltic itinerary will have about 7 or 8 ports of call. If you were to visit those same ports by making your own travel arrangements, it would most likely include several flights between the various destinations, which as we've already mentioned could add significant cost to the trip. Likewise, you would need to have lodging in each destination. 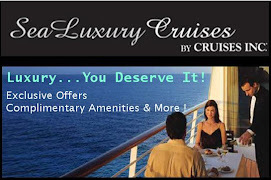 With a cruise, your lodging and transportation between countries is already included in the price. Meals and entertainment are also included, all of which would have been extras if sight seeing on your own. There are many ways to explore the countries that the ship visits. There are several options which fall in the budget travel category. We'll explore some of those which we used during a past cruise to the region. The picture above is a "hop-on-hop-off" bus. With this form of transportation you can typically start the tour when you get off the ship and conclude back at the ship, making a circle around the port city. For one low price, usually around $20 USD, you have the option to get on and off the bus as many times as you like to see points of interest along the route. This is how we toured Copenhagen for example. In several of our ports, there were shuttles from the ship that would take us into town. In Stockholm, we took the shuttle and then after a short walk, we were able to book a boat excursion "Under the Bridges of Stockholm". This two hour tour was one of the highlights of the cruise. 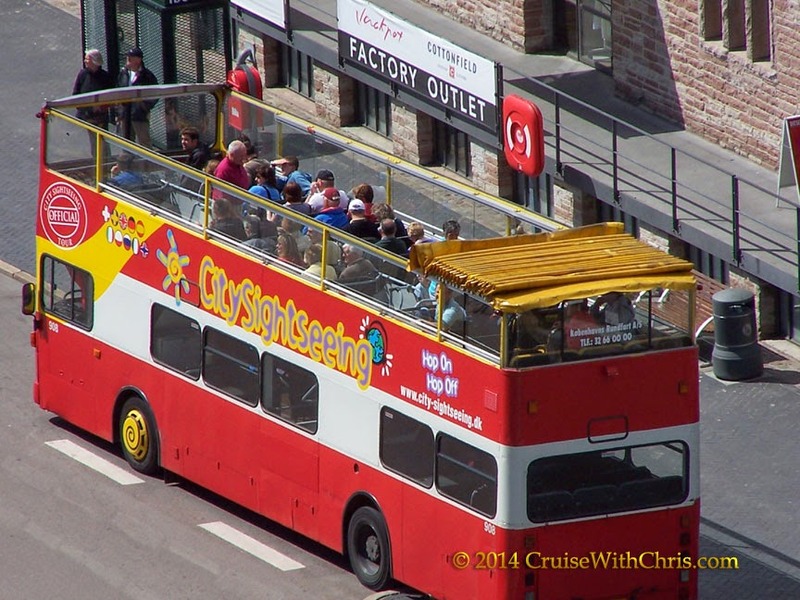 We also used the shuttle method to go to Tivoli Gardens in Copenhagen for an evening at the amusement park. 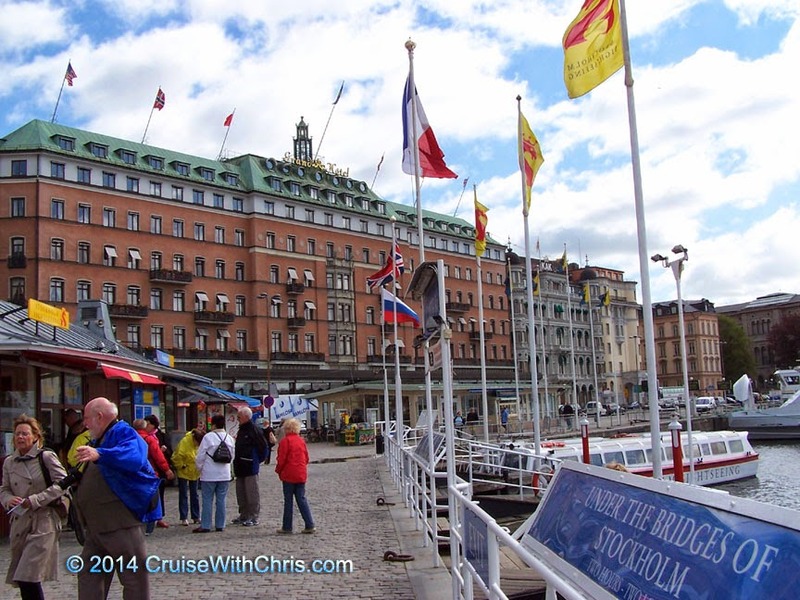 In many ports of call, it was possible to simply walk to nearby attractions. Such was the case in Bergen, Norway. 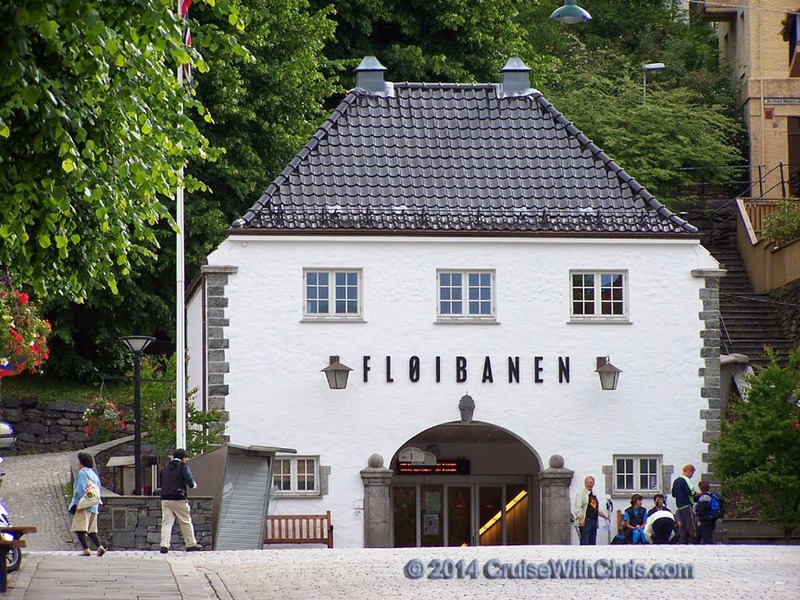 In this picture, we walked to the Fløibanen Funicular, one of Bergen's most popular attractions. Ride the tramway to the top for views of the entire area. If you decide to have a meal while in port, for example in Bergen, you have a full range of choices from the choices for the budget minded to expensive. Perhaps something in the fish market would give you a taste of Bergen on the budget side. 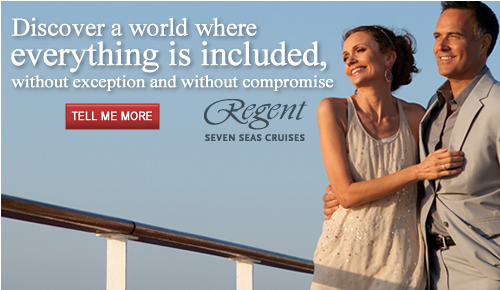 The great thing about cruising is that it is all about choice. 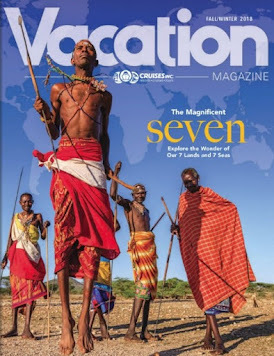 The cruise lines offer excursions, which typically cost more than if you organize the same tour on your own. The benefit to the ship's tours is that you don't have to plan anything and also, they are responsible for getting you back to the ship on time. Which ever way you decide to go, you have already saved money by not having to pay for hotels, meals, entertainment and additional transportation during your multi-port visit. 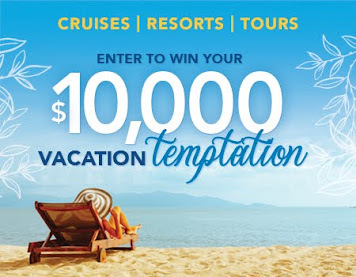 You are fast asleep and all of a sudden you decide to see what cruise ships are sailing to Aruba next month. OK, so you weren't fast asleep after-all. Nevertheless, you get out of bed and grab your cell phone or turn on your PC. 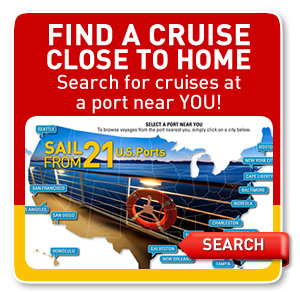 Picking from your browser favorites you pull up your favorite search engine and fill in a few options and there you have it a list of several cruises to choose from. 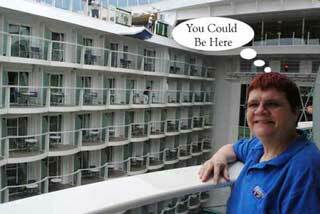 You narrow your selection to several on one of the cruise lines. Next, you want to learn more about the ship so you select their brochure from the website's brochure rack and begin navigating the pages. Next you put together a request for a price quote to your travel agent, via their website, or through your email client. Now, finally, you can go back to bed dreaming about sunny days laying by the pool or beach with a drink in your hand. All this without human intervention. Of course, you have several questions for your professional travel planner, but that can wait until morning. Prior to the days of the WorldWideWeb, this same desire for information would have had to wait until morning, unless you already had hard-copy brochures for the various cruise lines. You would have then made a phone call or visited your local travel planner who would probably have had to take some time to do some research. You may have been able to fall asleep dreaming about Aruba, but you wouldn't have known whether you could be going there next month. Nowadays, you can enjoy instant (as fast as your internet speed) information, tailored to your specific needs. Even if you are mobile, as long as you have an internet connection, there isn't any waiting for information. 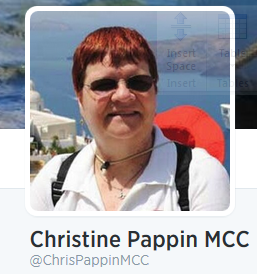 This is only one way that the WorldWideWeb has impacted the Cruise Industry. With technology advancements, it's possible to stay connected even while sitting by the pool sailing in the middle of the ocean. This need for connectivity has spurred upgrades on most of the cruise ships afloat today. We've covered that topic in past articles on our blog. Passengers want to stay connected to friends, family, and possibly work while on their cruise. The cruise lines have responded, with improvements to their networks. Most lines offer a variety of options so that every passenger can be accommodated based on their requirements. Not all passengers need streaming video for example, so those that do, pay a premium price to get that option. Network speeds have improved, but there is still a ways to go in most cases. 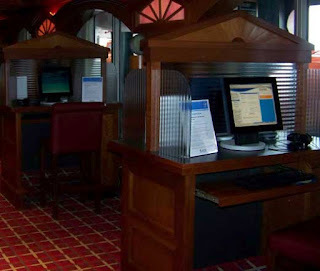 Even so, with unlimited packages, at least passengers now have a fixed cost option should they wish to access the internet onboard the ship. Whether you used your personal PC, tablet, phone, or ship's devices, you can stay connected to the internet throughout your voyage if you desire.